One of the worst things about the size of our house is that there isn’t a lot of storage. One of the catch all places is under our guest bed. We have the cat travel bag, a blow up mattress and other miscellaneous items. But the biggest culprit is gift wrap supplies. We built this rolling DIY under bed storage solution, that you can copy, to try to fix our problem! 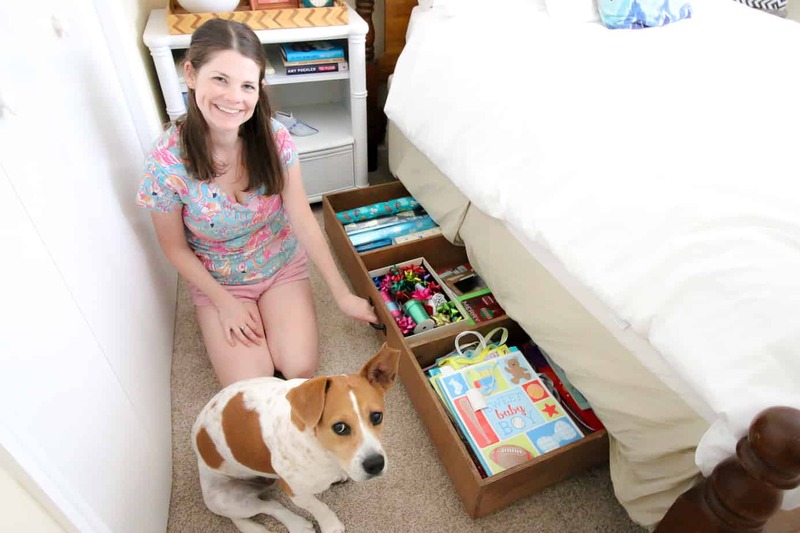 We built this DIY under bed storage for gift wrap supplies, but it could be used for basically anything you keep under your bed. 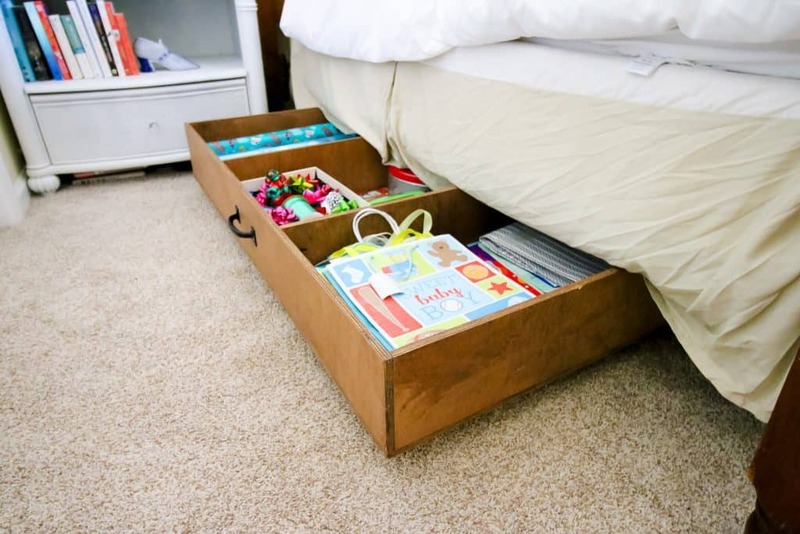 Whether you need storage for clothes, toys or toilet paper, this is the best under bed storage solution. 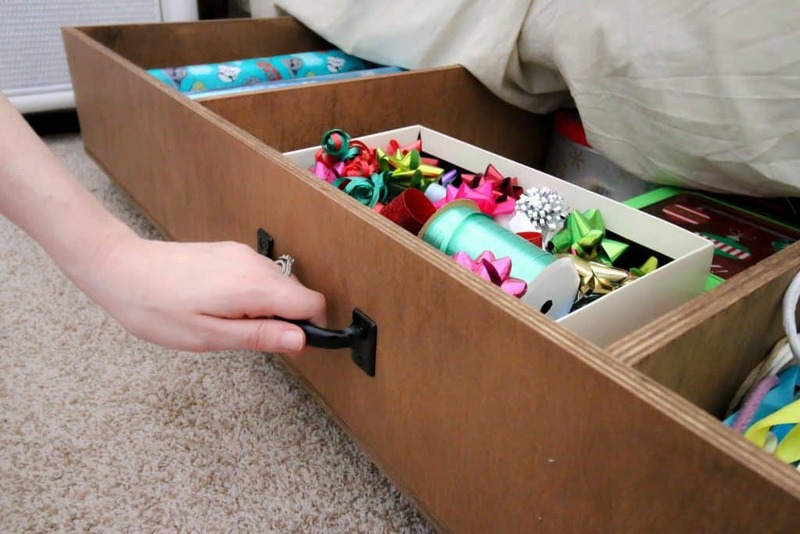 It’s designed as rolling under bed storage so it can be pulled out easily. Plus, with handles on both sides, it’s great for rooms without much space on either side of the bed. We can’t pull it out entirely on one side, but can get to both sides thanks to the handles. We partnered up with Kreg for this project because we wanted this to be easy to build and sturdy. 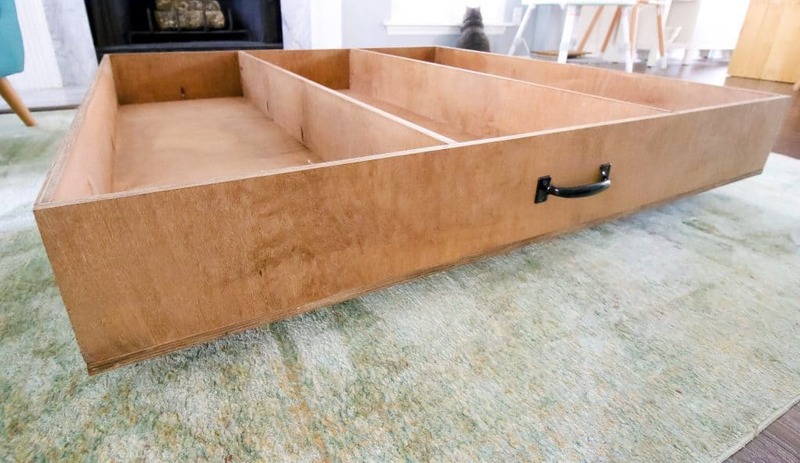 We put the entire set of project plans for this DIY under bed storage system on BuildSomething.com where you can get our step-by-step cuts, measurements and pocket hole placements. The entire project is built from one 4’x8′ piece of plywood with very little scrap leftover. However, there is enough scrap that if you wanted to customize the project a little more with smaller dividers, you could easily do so. The box itself is 6 inches tall, with 2 inch tall casters for rolling. It’s customizable with both of those in order to fit under your bed. The easiest way to make the cuts for this project is with Kreg’s Accu-Cut. 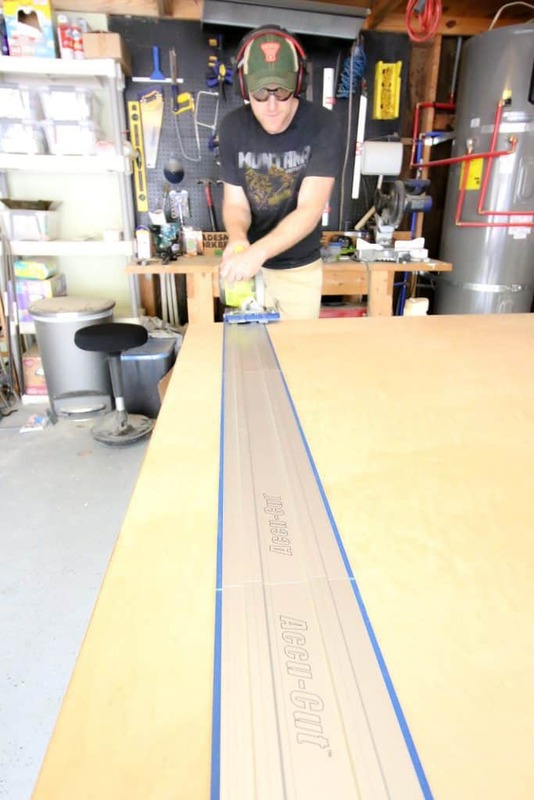 The Accu-Cut and the Accu-Cut XL make cutting plywood super easy. When you are starting a project with a full sheet of plywood, there’s no safe way to put it through a table saw because of it’s size. Kreg’s Accu-Cut makes it simple to rip down sheets of plywood with precision. All of the cuts for this project are done with the Accu-Cut. 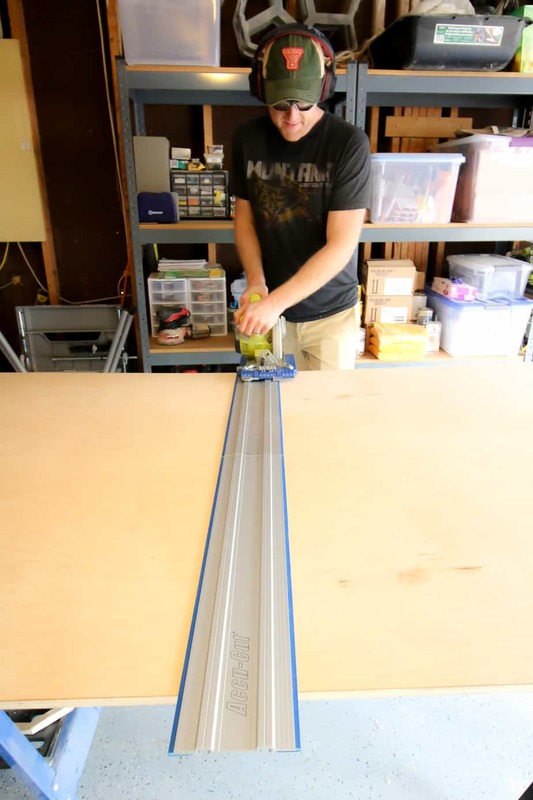 I love that the Accu-Cut XL can span the full 8 foot length of a sheet of plywood. So head over to Kreg’s BuildSomething.com to get the free plans for how to build DIY under bed storage for whatever you need it for. Their website is full of easy, helpful plans from lots of amazing builders. If there are any other storage options you need, BuildSomething.com is the way to go. We’ve got lots of other plans on there (like our geometric coffee table, our quick and easy ottoman, and our vanity stool), so be sure to check them out. This post was sponsored by Kreg and their BuildSomething.com website, which offers free, easy to follow woodworking plans to everyone. All opinions are our own and our opinion is that we love Kreg products. 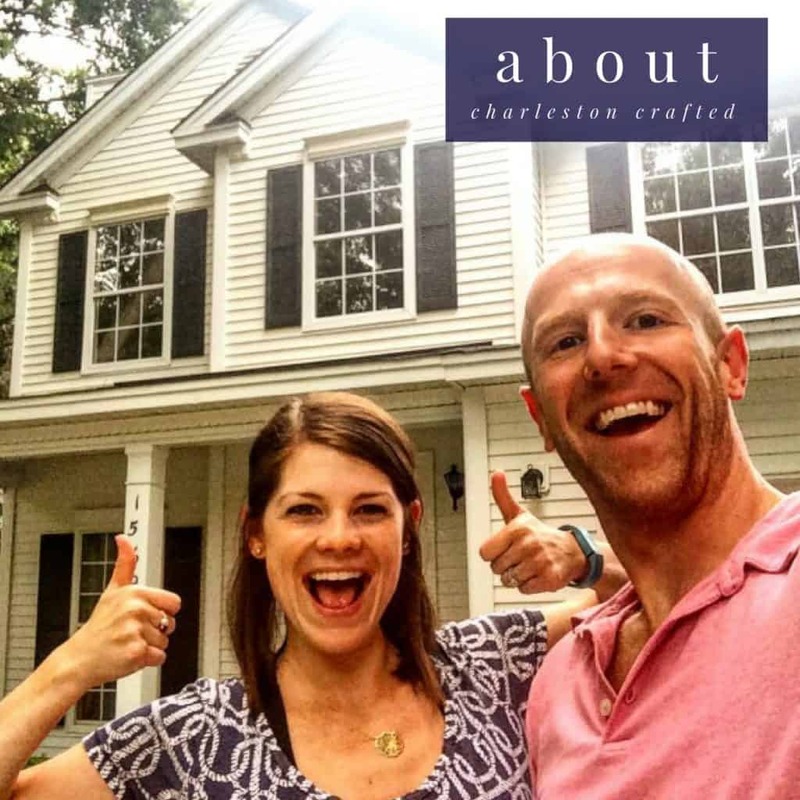 Thank you for supporting the brands that make Charleston Crafted possible!